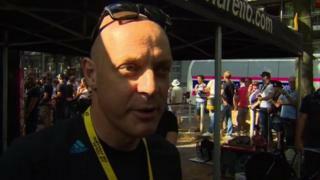 Team Sky team principal Dave Brailsford is philosophical after Bradley Wiggins came second in the Tour de France prologue, saying it was the "perfect" start. Fabian Cancellara's stunning time trial denied Wiggins the first yellow jersey of the 2012 Tour. The Swiss rider raced home in seven minutes 13 seconds to beat Britain's Wiggins by seven seconds.